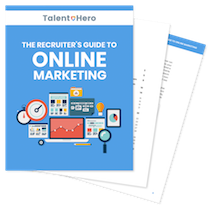 Big recruiting agencies typically have internal design teams that make all of their marketing materials shine. So how are you supposed to compete with them on a tiny budget? With a little bit of patience, you can use Fiverr to get high-quality cost-effective marketing work for your recruitment team done for you. The three most reliable types of work you can get completed on Fiverr are logo design, video intros and infographics. Getting a high-quality logo designed for your company used to set you back $250 at a minimum. Not anymore. If you are diligent about finding the right Fiverr designer for this task, you can get an awesome logo designed for under $50. First, head straight to the logo design section of Fiverr with this link. Next, start looking through the various portfolios of the thousands of designers until you find someone whose style you like. I would suggest looking through at least 20 portfolios so you can be confident you have found a developer whose vision is aligned with yours. 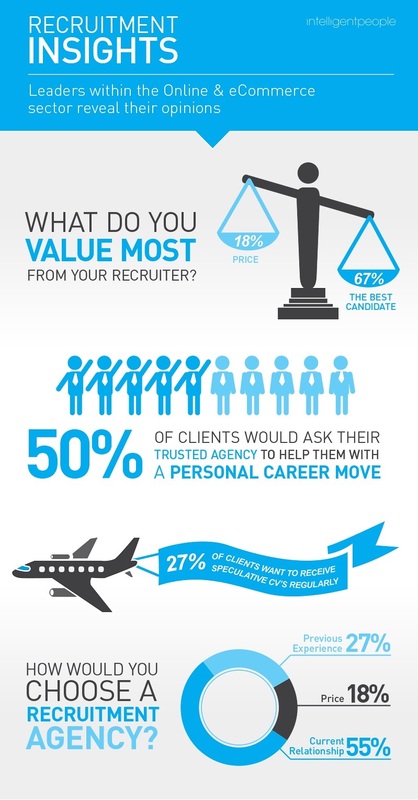 Before you hire, make sure you understand exactly what you’re paying for. I would suggest always purchasing the vector files, transparency and source files. When you have these files, you can easily re-purpose the logo in the future for different marketing needs. Also, if you ever want to make any small tweaks, you can hand off the source files to another designer and get those tweaks done easily. I would also suggest going with a designer that offers unlimited revisions. 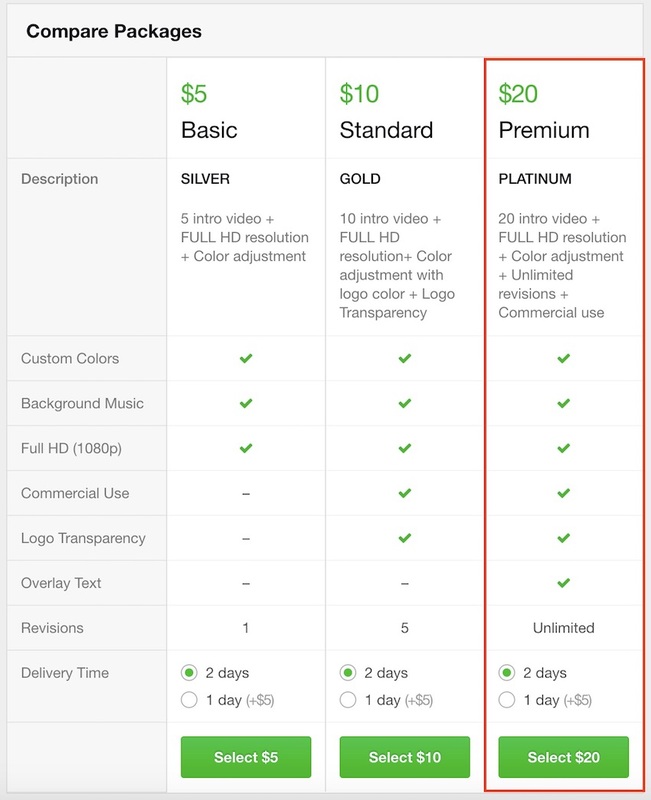 In the example package below, if you were to choose the $30 standard option, you would receive everything you need at a highly reasonable price. The one downside to working with cheap designers is that they don’t always deliver what you might expect based on their portfolio. If you’ve made a reasonable effort to work with them and they still can’t nail your vision, don’t be afraid to ask for a refund. Most designers are more than willing to offer one to avoid having a dissatisfied client. With the proliferation of modern smartphones, it is has never been easier to use video content as part of an overall recruiting agency marketing strategy. Nonetheless, one of the challenges of creating a professional looking video is having an intro (and outro) that take your content to the next level. With Fiverr, you can get a video intro that you can re-use at the start of every video you create to brand your videos just like the largest companies in the world. You can head straight to the video intros section with this link. Next, much like the logo design process, look through at least 20 portfolios to find a video editor whose style you like. When you find one you like, you will notice that the cost of these video intros tend to be cheaper than the logo design. This is because the process of creating a video intro can be automated with software. This means you can typically choose the most expensive package without breaking the bank. For example, this editor offers 20 different intro videos and unlimited revisions for only $20. He will also create additional text animations that you can use as scene transitions in the middle of your video. Everyone who is a regular user of the Internet has come across an infographic at least a few times. The reason for their increased popularity over the past 5 years is that research shows that they are a highly effective way of presenting data to a reader. Infographics tend to have far higher engagement rates than than data presented in basic tables or charts. Would you rather look at this table? The answer is obvious. 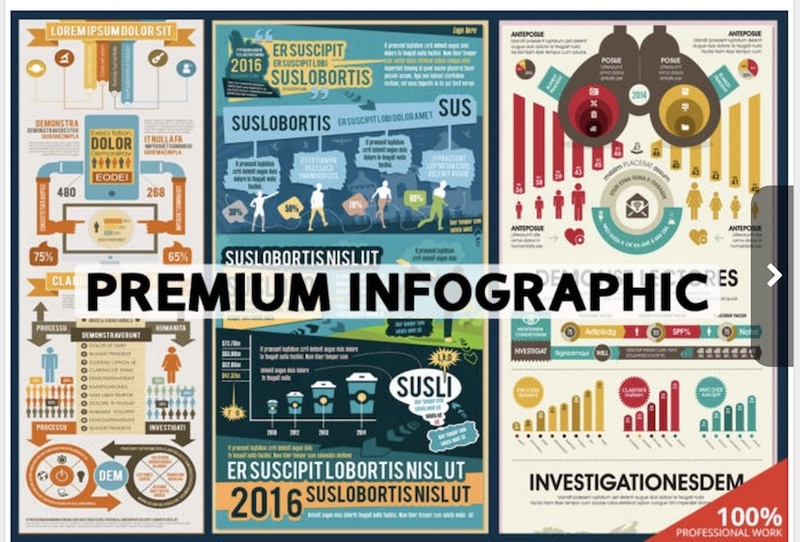 Infographics sell your data better than any other format. And with Fiverr, you can get an infographic made at a highly affordable price. To get an infographic made using Fiverr, you will need to start with some idea as to how you want to lay out the data. 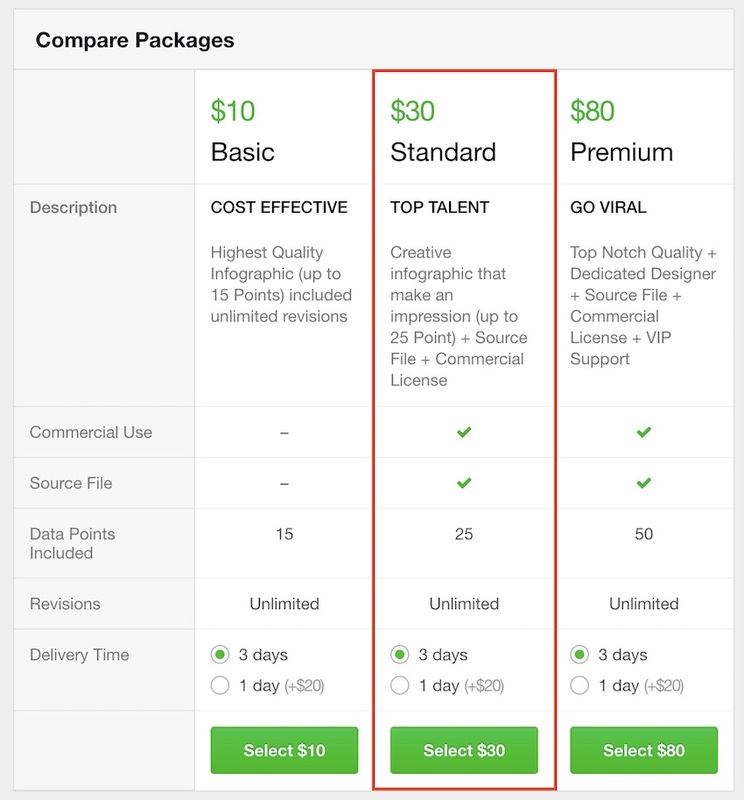 You don’t need an actual design but giving a Fiverr designer five tables of data and asking them to logically organize them will not get you good results. Your best bet is to sketch out your idea on a piece of paper and then submit that along with clearly labelled data files that correspond to your sketch. Once you have your idea, go here to find your infographic designer options. For infographics, you may need to spend a decent amount of time looking through portfolios. Finding an infographic designer on Fiverr that produces high quality work is not as easy as finding a logo designer or video editor, simply because designing an infographic that conveys a lot of information in a visually appealing way is not typically an easy task. However, with some persistence, you will find what you’re looking for and you can still do it at an affordable price. The designer below will create an infographic with 25 data points for only $30. If you went to a design agency, you’d be looking at a price of around $300 – $500 for the same task. From my experience, you should stay far away from SEO services offered by Fiverr vendors. Proper SEO, even on-page SEO, is time-consuming and requires someone who really understands the subject matter. Paying someone $50 to tackle a difficult task such as this is not going to add any value to your site. Furthermore, unless you have some understanding of what SEO is, you probably won’t even know how to check that the work was performed so it’s best to stick learn the basics yourself or, if you can afford it, go with higher-paid professionals. Another task you want to avoid on Fiverr is blog writing services. Much like SEO, blog writing requires an understanding of the subject matter. Also, many of the blog writers on Fiverr do not speak English as their first language and their work is clear evidence of that inconvenient fact. An alternative service like iwriter.com tends to produce better quality work but even there, you may have to go through a few writers to find one that meets your needs. With a bit of patience, Fiverr can be the source of all your digital design needs and allow you to compete on a branding level with some of the top recruiting and staffing agencies that have full-time dedicated staff assigned to these jobs.